The wedding rehearsal party may seem a bit outdated. Unless you’re having some sort of three-day wedding á la “My Best Friend’s Wedding,” many people think that planning and paying for a wedding is about all they can handle. However, if you’re inviting hundreds of guests and you’ve meticulously choreographed the wedding ceremony, then a rehearsal party is not completely out of line. In fact, it may eliminate some stress. Anything that eliminates stress from the wedding day is a good thing, so book now for your wedding rehearsal dinner. 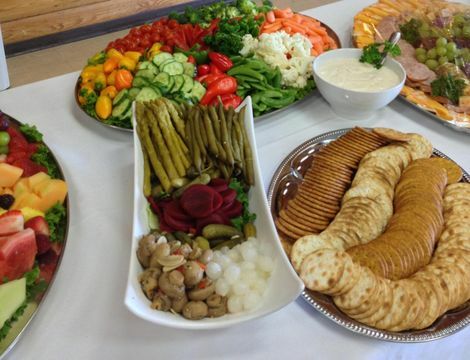 The food at the rehearsal doesn’t have to match the theme of the wedding. In fact, make it something completely different so that the wedding food is all the more special. Everyone needs to get up early and fit into their wedding clothes, so keep the rehearsal dinner light and fresh so you don’t wake up bloated and heavy. After the rehearsal, everyone gathers for a celebration dinner, where the bride and groom are the center of attention. In this less-formal setting, family members meeting for the first time can mingle and get better acquainted. Unlike the Big Day, the bride and groom are under less pressure and have more time to talk with relatives in a relaxed fashion. Once everyone has arrived and is seated, either the bride or groom should take a moment to welcome their guests with a few heartfelt words and thank them for attending. Numerous toasts are usually part of the rehearsal dinner. If you need someone to start the toasts, the groom's father is a good choice.